Since we still had fried chicken we reheated it and paired it with s Yellow Curry Chopped Salad, which was pretty good. The salad kit was $3.99 but it makes four serves, or $1.00 per serve. Lunch today was better than with beans and rice for $3.73 per serve. 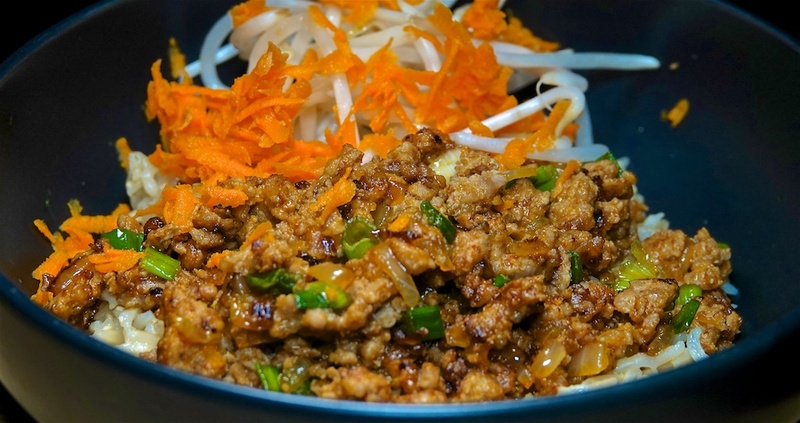 One of our favorite ways to use ground pork is Vietnamese Caramelized Pork Bowls, tonight with mung bean sprout and grated carrot and butter rice. The butter rice was a little bland, which paired perfectly with the intensely flavored (and slightly salty) caramelized pork mix. A little crisp freshness from the sprouts and carrot and it was a well balanced meal for $3.67 per serve.